Snacks? Check. Drinks? Check. Tons of figures to play with? Check. Does this sound good to you? 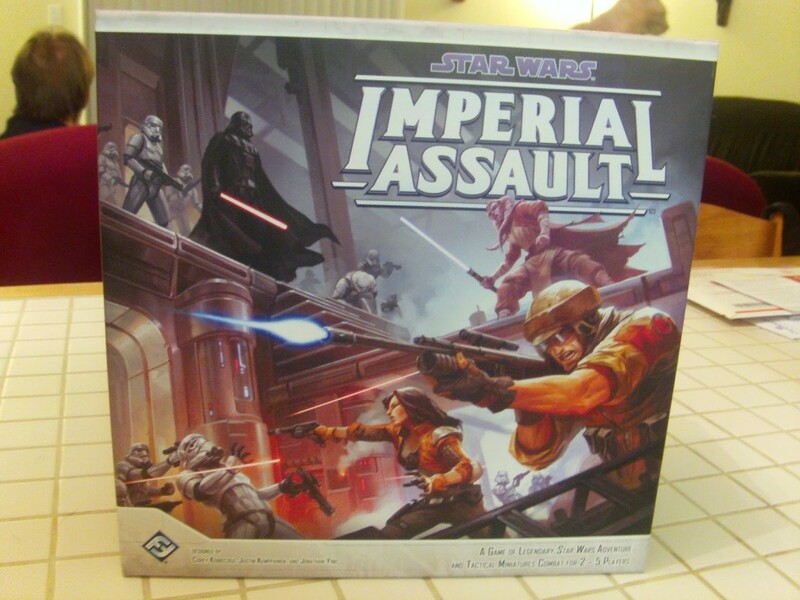 If it does, read on, dear reader, as today we will be discussing Star Wars: Imperial Assault– a sprawling miniatures game from Fantasy Flight Games. For those of you unfamiliar with this title, Star Wars: Imperial Assault is essentially a dungeon crawler set in the Star Wars Universe just after the events that take place in Episode IV: A New Hope. (Many people have compared it to Descent, a similar game by Fantasy Flight Games, but with a fantasy theme.) In Imperial Assault, each player assumes the role of an intrepid member of the Rebellion, working together over the course of several missions to take down the oppressive Galactic Empire. One player, however, is in charge of the Empire’s forces. Following the directions of the campaign guide that comes with the game, this player fills a role similar to that of a Dungeon Master- they read out the premise of each mission (and other sections of text when prompted to by the guide), they set up the modular board to create the terrain for each mission and they place the Imperial troops our heroes will face in each mission. Before we get too far into this piece, I would like to make a quick disclaimer: the campaign of this game features eight missions (with numerous side quest missions in between them.) So, as it stands, I have not been able to play through the entirety of this game. That is why this isn’t a review as much as it is me telling you about my experience playing it and my thoughts on the game so far. “Isn’t that what a review is?” I heard you ask. Well, yes, it is- but our A Space Ahead legal department has suggested that I give you the aforesaid disclaimer before anyone starts yelling at me about journalistic integrity. Now that that is done, the lawyers shall be sent to frozen hellscape of Hoth to await any further kerfuffles to sort out. See you later, Gerald. So, with this brief foray into Imperial Assault, what was the consensus? Well, first (if this wasn’t obvious) this is not a game for beginning gamers, nor is this a game for people who want an experience that is neatly resolved in twenty to thirty minutes. This is a game for people who have experience playing more complex games (and preferably some roleplaying or miniatures experience) and realize the time commitment involved if they wish to see the campaign through to the end. That being said, it was agreed on by everyone playing that although this is a roleplaying game, none of us felt as if we were really playing the role of our character- but that could be because it was our first time playing and were still concerned mainly with following rules and coming to grips with the mechanics and basic strategy of the game. So if you know what you’re getting into and you have a group of friends willing to make the time commitment, Star Wars: Imperial Assault could definitely be for you. The miniatures and the modular board are well made and fun to play with between turns, the rules are extensive but not oppressive or overwhelming and the whole thing is an experience that most Star Wars fans will eat right up. So check it out dear readers and look for an article where I share my final thoughts in the future when my group completes the campaign. May the Force be with us. Want to take the fight to the Empire? If you live in the Bloomington area, you can find this game at The Game Preserve. If not, check it out at your local game store. Support local game stores!